This is a meal that I've been making for the past 3 years or so, and I look forward to it every year after Thanksgiving. The recipe was part of a spread in an issue of Better Homes and Gardens on creative uses for Thanksgiving leftovers. I love finding recipes that go beyond Turkey Pot Pie and Turkey Noodle Soup, and I LOVE Mexican food, so this was of course a winner for me. 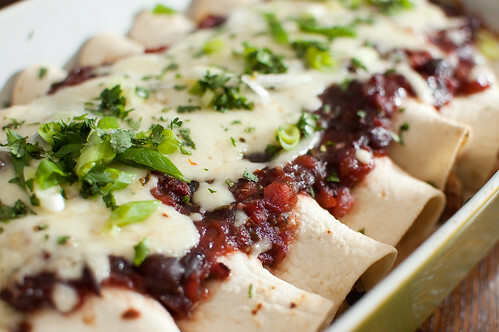 I know it seems kind of weird to use cranberry sauce in enchiladas, but trust me, it is magical. It adds just a hint of sweetness, which is balanced out by its tartness and the spiciness from the pepperjack cheese and hot sauce. These are just so ridiculously good, that I think I'll start making them year-round with a rotisserie chicken. I served these with Fajita Sweet Potatoes and Pomegranate Mojitos (recipe to be posted Thursday). I think this would make a really fun meal for the weekend following Thanksgiving - turn your leftovers into a fiesta! Preheat the oven to 350 degrees and lightly spray a 9x13 inch baking dish with cooking spray. In a large bowl, combine the turkey, 1 cup of the cranberry sauce, the beans, sour cream, 3/4 cup cheese, 1/2 cup of the salsa, green onions, cilantro, cumin, salt, and pepper. Spoon about 1/3 cup filling into each tortilla, and roll tightly. Place seam-side down in the baking dish. In a medium bowl, combine the remaining cranberry sauce, 1 cup of salsa, and the hot sauce. Stir to combine and Pour over the enchiladas. Cover the dish with foild, and bake 45 minutes. Remove foil, and sprinkle with remaining 3/4 cup cheese. Continue to bake, uncovered, an additional 10 minutes, or until cheese is melted and bubbly. Sprinkle with additional cilantro and scallions, and serve. This doesn't look weird to me at all. What it does look like is the perfect way to enjoy Thanksgiving leftovers (instead of the boring go-to sandwich). I think this is definitely the most creative use of Thanksgiving leftovers I have ever seen! And I love the name change, cute! what a creative way to use up thanksgiving leftovers! it looks delicious. i will definitely be utilizing this recipe after turkey day because i know we will have TONS of leftovers. I've got some leftover cranberry sauce and I think this sounds really good! Thanks for the recipe. Sounds delicious! Do you have the Fajita Sweet Potatoes recipe posted? That looks absolutely wonderful! I want to try that with our Thanksgiving leftovers. Sandwiches are so boring, but not this! Thanks! I'm going to bake a turkey, now, just so I can make this. Looks delicious! I love the name of the recipe and it sounds fab too. Brilliant, I'll be getting my jar of cranberry sauce very soon for Xmas so these will be on our list to try. Oh goodness, these "cranchiladas" (love the name) look awesome! Cranberry sauce is so versatile, and I love the combination of ingredients you used for this recipe. The pomegranate mojitos sound yummy as well. Wow, one of the most unique enchilada recipes I've seen. It looks killer! Hm very creative and different. I may have to try this with some of the leftovers. It does look good! I love "weird" forms of enchiladas...recently made some kale & bean ones with pumpkin sauce. Adding these to my list! I never would have thought to put all these things together, but it sounds fabulous! Oh.em.GEE! I need to have these now. Makes me kind of sad that I'm traveling for thanksgiving. Maybe i will have to make a leftovers turkey when I get home. This sounds strangely good! I'd be tempted to swap cheddar for the pepperjack, though. Love it with fruit. I'm not a fan of turkey soup -- so to me this is a wonderful use of leftovers! Just tried these with Christmas leftovers...they were divine! And my dad said they were his favorite leftovers EVER! Those enchiladas look really good! Great idea! I wrote about their deliciousness here on my blog. Thank you so much for the recipe. You are AWESOME and so are the Cranchiladas! Woot woot! We used our leftover turkey last night! Loved them! Thanks for a great recipe! Sounds excellent! A perfectly unboring way to use leftovers! Thank you for the great recipe!